Dunnan, Dana. Notes to a New Teacher: A Not-for-Dummies Guide for Beginning Teachers. (Illus.) Walden, Vermont: Random Recollections House, 2013. 228pp. $7.99. ISBN 9781491297643. 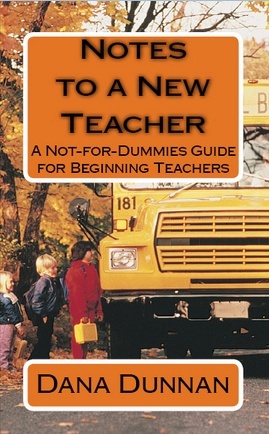 Notes to a New Teacher: A Not-for-Dummies Guide for Beginning Teachers is a fast read that is filled with lots of great tips for new teachers from a seasoned veteran teacher who shares stories about teaching and how his teaching changed over time to be more learner-centered. He also shared insights in how to support his students in many ways, and how to view students as individuals rather than simply vessels to fill with information. Individualized instruction was an important emphasis for him, as was helping students solve personal problems. He shared strategies for teaching science that would help students conceptualize complex ideas in chemistry—the reader may even learn some science when reading this book! One of the other very interesting parts of the book was the chapter that talked about him taking on a journalism assignment, and how even though he was a science teacher, and even though he had no textbook, he and his students won several awards. It was especially interesting noting his ideas for using the newspaper to advance some of his own agendas in education. It was interesting to hear his insights on assessment and grading. Dana Dunnan has a few years on me in the classroom–about twenty to be exact. He has taught a variety of subjects at the high school level in wealthy suburbs north of Boston for a long time. He also worked at the Harvard Graduate School of Education and on education policy at the state level in Massachusetts. On the surface, I certainly didn’t see any parallels to my experiences in and out of the classroom. Yet as I read Notes to a New Teacher: A Not-for-Dummies Guide for Beginning Teacher, I felt like I had found a kindred spirit. Dunnan’s advice sounds eerily close to my own, supported with stories about his students as well as interactions with amazing people like legendary UCLA coach John Wooden. The book is written in a conversational tone, as if Dunnan was sitting down with you for a few hours to chat about teaching, not unlike my own work aimed at helping young teachers.